A day of rich celebration for the Catholic faithful. We were very proud of our Catholic identity together – Portlaoise parish. Pope Francis has stated that his visit to Ireland brought great joy, but also “pain and bitterness for the suffering” caused by various forms of abuse by members of the Church, and the fact that “ecclesiastical authorities in the past have not always been able to deal appropriately with these crimes”. Pope Francis, speaking during the weekly General Audience on 29 August in St Peter’s Square, said that that his two-day trip was to confirm Christian families in their vocation and mission. However, he also spoke about his meeting with the eight survivors of abuse and how on several occasions he has asked the Lord for forgiveness “for these sins, for the scandal and the sense of betrayal procured”. He said that despite the faith of people in Ireland there are few vocations to the priesthood because of the scandals and other great problems. 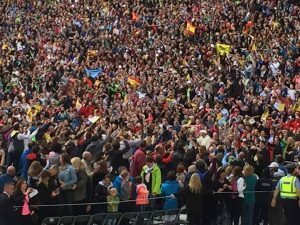 The Church of Ireland Archbishop of Dublin and Glendalough, Michael Jackson, in reflecting on the visit of Pope Francis, said that the Pope was “a figure of such international stature and significance”. The Archbishop also expressed appreciation for Laudato Si’ and Amoris Laetitia, which influenced WMOF. At the RDS, he heard many of the deliberations on safeguarding. “Both WMOF and the visit of Pope Francis found that the voice of the victim of sexual abuse was paramount and to the fore. There was no escaping this during or after the visit. Nor could there have been from a human and a divine perspective, from either church or state,” he said. The film Pope Francis – A Man of His Word impressed Archbishop Jackson in the way in which it showed how Pope Francis engaged with people in silence and “with people who simply were not able to speak whether because of their physical incapacity or their circumstantial trauma”, and he said the Pope brought this spirit to Dublin. Many couples and parishes have also been reflecting on the Papal visit and WMOF. Fr Paddy Byrne of Portlaoise parish told Catholicireland.net that 300 people travelled by bus from the area and many more as well. Meiread and Ronan Ashe from Allen parish were present from the opening service for WMOF in their own Diocese of Kildare and Leighlin to days in the RDS pastoral conference with others from the area who travelled in a mini-bus and then on a 50-seater bus with fellow parishioners to the Phoenix Park. Above all, they felt a real sense of “being one family” and that their parish has been on a faith journey together through many preparation meetings for WMOF throughout the year. He added that not only did he get to know his fellow parishioners better by spending the day with them, but also people of nearby parishes who were in the same block at the Papal Mass. 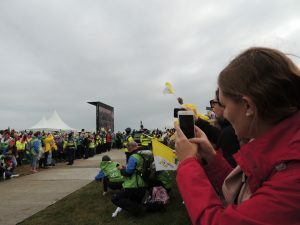 She has been putting up pictures on Facebook to reflect the true experience of WMOF, and the actual crowds present. She said that there was a festival atmosphere at the Papal Mass, but it was very solemn as well. She added that she had already been surprised to see someone from her work attending the Mass although they would not say they were devout Catholics. Younger members of her extended family who would not be easily led were also present.